Freemason's Car Emblem Decal - with standard Masonic Tubal Cain symbol over a light blue background with adhesive mounting tape on backside. Checkout our many other decal styles, emblems and colors! Masonic Merchandise and gifts. Gold color steel cuff links with Masonic Past Master Masonic Symbol. Great as a Freemason Lodge Gift, Regalia or Formal Wear accessory. RedlineGoods headrest covers custom-made for your Mustang 2010-14 - tailored-fit, not universal!. Availabile in over 40 types and colors of leathers/fabrics/threads, with lots of custom finishing styles such as stripes, piping, racing stripes. Best of breed products from a store with 99% 4/5 star ratings. 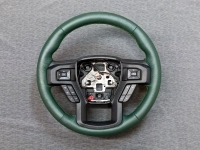 RedlineGoods steering wheel cover custom-made for your F-150 2015-17 - tailored-fit, not universal!. Availabile in over 40 types and colors of leathers/fabrics/threads, with lots of custom finishing styles such as stripes, piping, racing stripes. Best of breed products from a store with 99% 4/5 star ratings. The classic oval frame features glossy, hand-polished rim decorated with blue floral pattern. The bridge and part of temple arms adopt silver metal, which adds brightness to the glasses.Blue acetate temple tips are also stylish.There might be some differences due to different lights in sunlight and screen. Random floral patterns may differ from pictures. Goods shall be in kind Prevail. Top Quality 316L Stainless Steel - Black and Silver Color Lightning Style Ring - Width is approximately 7mm (puzzle - two piece section ring style). 316L is the highest grade of stainless steel used in the jewelry market. It is so good at resisting fade, rust, and corrosion, that it is used in architecture as well as in marine environments. At the same time, it is safe to use for medical purposes inside the body. It will not fade, change color, or leave stains on your body. It doesn't even require any maintenance to keep it looking new. Shopping Tip: To order similar style rings in different sizes, select the desired ring size and then click "add to cart." Choose another size and click "add to cart" again.